Indoor cycling (spinning) sessions. These generally run in the spring from January to March, and in the fall from October to December. The focus is to build strength. Outdoor rides. 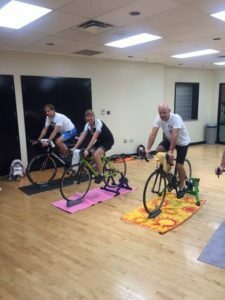 These generally run from April to September, and are focused on building distance towards various cycling or triathlon races. 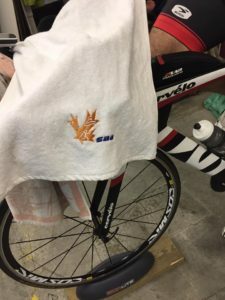 Coached bike program. New for 2017! All spinning sessions and rides are posted on the SAA Google calendar . * Any cancellation will be posted on the SAA google calendar at least 1.5 hours before the start. 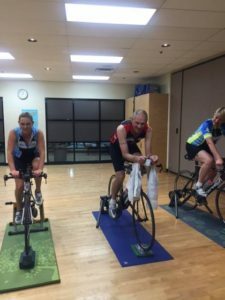 Indoor spin classes are run by our very own Sonya Vanderwel! She puts everyone through a series of drills guaranteed to build strength and endurance, and make you sweat!! The sessions are held at Back in Motion in Richmond on Saturday mornings at 8:30am (1-2 hours). Note: this is the start time – arrive early to be ready to go. 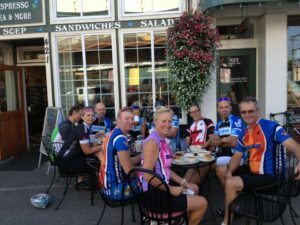 Join us after the spin on Saturday mornings for coffee and treats (please bring a breakfast item to share). What to bring: bike, trainer including rear wheel skewer, front wheel stand, large towel or yoga mat to place under your bike (MANDATORY to protect the floors), heart rate monitor and/or bike computer, water or your favorite sports drink and your appreciation of music. Location: Back in Motion #140 – 6651 Elmbridge Way, Richmond. Our outdoor rides during the spring and summer are free, and are led by at at least one certified community coach. The focus of the Wednesday evenings rides is generally on hill training and/or tempo workouts. The focus of the Saturday morning rides is generally on distance. The ride distance will vary, but will generally increase as the summer goes on. 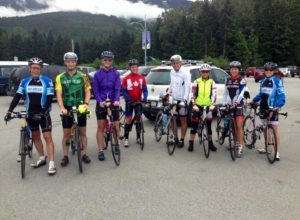 Given that not all of our members are at the same level and/or training for the same events, generally there will be several break-out groups that may go at a different speed and not necessarily do the full posted distance (many of the routes are “out and back” so it is easy to do a shorter distance). Refer to the SAA Google calendar for all start times and locations (generally Wed at 6:30pm, Sat at 8:30am), distance and route. Note: arrive early so that you have enough time to get your bike setup and ready to go. What to bring: bike, helmet, heart rate monitor, bike computer, water and/or your favorite sports drink, cell phone, tire change kit, printed map (if you need one), money (if you stop at a store or for post-ride coffee). 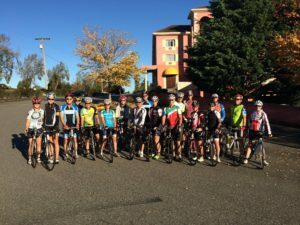 Coached bike program – New for 2017!